Rare Books at the University of Melbourne holds a significant collection of books, journals and ephemera, about 250,000 items. Strengths of the collection include printing history, Greek and Roman classics, private presses, English literature, social and political thought, children’s books, Australiana and book arts. These items are housed in special conditions by reason of their age, value or uniqueness in order to ensure their care and preservation for current and future generations of scholars and researchers. Some significant works held are Piranesi, Collection of folio works, 1761-1807; Colonna, Hypnerotomachia Poliphili, 1499; Mr William Shakespeares comedies, histories and tragedies (Second folio) 1632; John Gould, The birds of Australia, 1848 and the Mammals of Australia 1863; Latin Bible Mainz: Peter Schoeffer 1472; Parler seul : poème Tristan Tzara and Joan Miró 1950, Dlia Golosa. Mayakovsky, Vladimir and El Lissitzky 1923. The majority of Rare Books are catalogued, however some collections may only be accesible via card catalogues or lists. Material in the Australiana Collections may be accessed through the Cultural Collections Reading Room in the Baillieu Library. Requests for material can be made online prior to visiting the reading room. To request material, please use the Aeon request management application. Smith, James Edward, Sir, 1759-1828. London : Printed by J. Davis: Published by J. Sowerby, 1793. The Australiana Collections comprise books and some serials, newspapers and pamphlets published in Australia or on Australian subjects or by an Australian author. The largest of the Australiana collections - the AX collection - originated from books that were formerly on the Library's open shelves. The three other collections of Australiana general works which complement the AX collection - the McLaren Collection, Meanjin Books and the Grimwade Collection - originated from the private libraries of three donors. Also included amongst the Australiana collections are any works that have emanated from the University of Melbourne: the Thesis Collection, the University Collection and the Melbourne University Press collection, and the several collections named after the individual or the organisation who has donated them. The Book Arts can go back to illuminated manuscripts, as examples of illustrated books. Later important illustrated books are the Livre d’artiste and modern illustrated book and Private press. Rare Books holds around 350 artists’ books, the majority of which are Australian made with many created by Melbourne artists. Artists’ books are usually handmade and are published in small editions over which the artist maintains control over the production of the work. As such, they are varied in form and may include foldouts, be unbound sheets presented in a box, scrolls or traditionally bound. We also hold materials associated with the production of Artists’ Books such as preliminary notes, sketches, plans, wood or lino cuts etc. The aim being to be able to present these with the finished artwork to demonstrate the steps in the creative process. The collection aims to demonstrate the history and development of Book Arts both within Australia and Internationally. we hold examples of livre d'artiste, Russian constructivism and futurism. The Gerard Vaughan, Ray Wilson and Ian Brown collections of art, design and architecture reference books has added significantly to our holdings on art. Material in the Australiana Collections may be accessed through the Cultural Collections Reading Room in the Baillieu Library. Requests for material can be made online prior to visiting the reading room. To request material, please register and order. Small collections of ephemera material, including personal papers and other unpublished material such as artists' scrapbooks and records documenting the Victorian Peace Council. This collections consists of non-Australian early printed books, periodicals and pamphlets which, because of their age, beauty, rarity or other factors, are not suitable for placing on the open shelves. The collections also include manuscripts, high quality facsimiles, modern limited editions, examples of fine binding and printing and notable private press collections, including Ashendene, Doves and Kelmscott Press. Although the cut-off date for inclusion is generally 1880, there are also many later books in the collections. The largest non-Australian collection, the BX collection, originated from books which were formerly on the Library's open shelves. Other collections are based on the private libraries of individuals, primarily Dr Orde Poynton (much of the Rare Book Room collection and the English Room Collection) and Dr Pierre Gorman (the Cambridge Collection). Sketches in the environs of Sydney : being part of a series of sketches intended to illustrate the scenery of New South Wales. 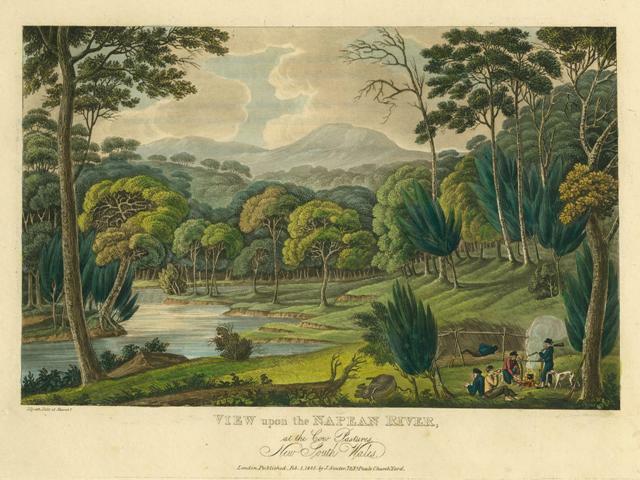 Views in Australia, or, New South Wales & Van Diemen's Land delineated 1824-1825.